Russell McGilton is an award-winning playwright, published author and comic performer. 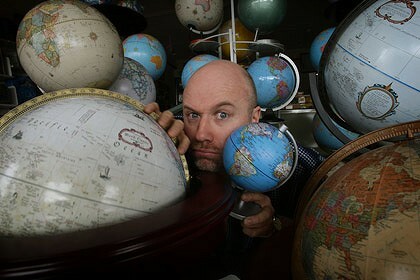 His one-man show Bombay to Beijing by Bicycle won the George Fairfax Award and became a sell-out hit at the Melbourne Fringe 2005, Melbourne Comedy Festival 2006 and Edinburgh Festival 2008. A book of the actual journey was published Penguin as Yakety Yak. Sought after as a public speaker, Russell was part of the STA travel debating team that included Julia Zimero, Lawrence Mooney, Helen Razer, Tony Wilson, Samuel Johnson and Libby Gorr. He has also been invited to MC and perform at numerous schools and corporate engagements for clients such as Price Waterhouse Coopers, Monash University, Intrepid Travel and as far away as Mumbai, India for Corenet Global. Russell was also featured at the Melbourne Writers’ Festival 2004, Red Symons’s 774, Tracee Hutchison’s 3RRR, Russell Gilbert’s Radio SEN 1116 and the Conversation Hour with Waleed Aly. In 2007, determined not to allow the Howard government back into the power, Russell wrote and directed Seditious Delicious: A portrait of John Howard (Melbourne Fringe), a live radio play starring Justin Kennedy, Tim Harris and Vanessa Bennett. It was a work so remarkable even Andrew Bolt admitted in somewhat defeated tones that the show was ‘incisive and funny’. Apart from contributing travel stories and witty observations to The Age, The Australian, and The Big Issue, Russell has written numerous plays and won The Peoples Choice Award, Crash Test Dummies, at the Sydney Short and Sweet 2010. In 2008, Russell was invited to judge Boroondara Literary Awards.